"A nice and zesty twist to the traditional deviled eggs. A real crowd-pleaser!" Cut each egg in half lengthwise; place egg yolks in a bowl. Mash yolks with a fork until smooth; stir in mayonnaise, green onions, rice wine vinegar, and wasabi paste. Season with salt. Arrange egg white halves cut-side-up on a serving platter. Spoon yolk mixture into whites; garnish each egg half with pickled ginger and pea shoots. Zesty deviled eggs are a hit at potlucks, picnics, or as a party appetizer. You can also use watercress if pea shoots are not available. Great variation! I topped the finished deviled eggs with Tobiko (flying fish roe) for added color and crunch. Beautiful! These were fantastic. Didn't have the onions or pea shoots. The ginger brought all the flavors together. This will forever be our 'go-to' recipe for deviled eggs. 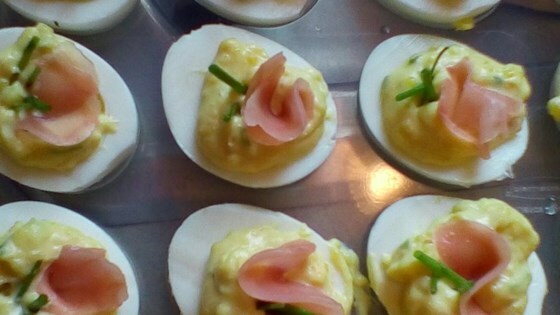 So simple to make and quite different from the everyday deviled eggs. Definitely will make again. Didn't have the garnish items so served them without and still was a great hit! These are amazing! I will be making these again. Made these as per the recipe without the pea shoots. Everyone loved them so we made more.